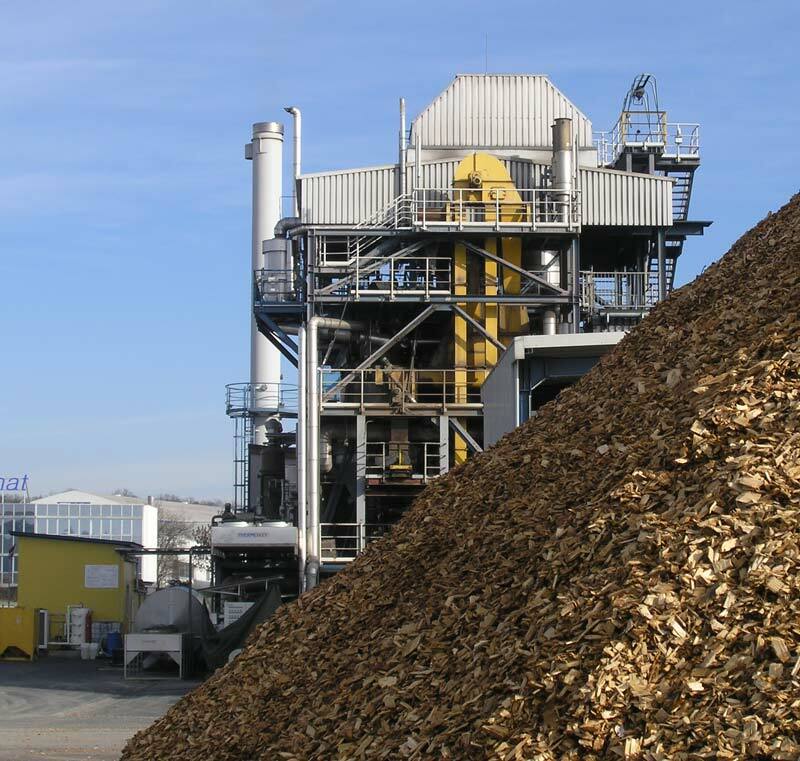 Biomass gasification involves burning of biomass in a limited supply of air to give a combustible gas consisting of carbon monoxide, carbon dioxide, hydrogen, methane, water, nitrogen, along with contaminants like small char particles, ash and tars. The gas is cleaned to make it suitable for use in boilers, engines and turbines to produce heat and power (CHP). Biomass gasification provides a means of deriving more diverse forms of energy from the thermochemical conversion of biomass than conventional combustion. 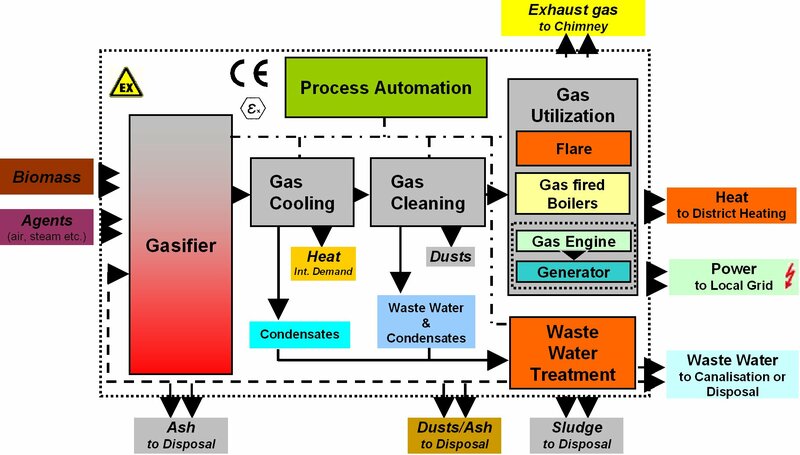 The basic gasification process involves devolatization, combustion and reduction. During devolatization, methane and other hydrocarbons are produced from the biomass by the action of heat which leaves a reactive char. During combustion, the volatiles and char are partially burned in air or oxygen to generate heat and carbon dioxide. In the reduction phase, carbon dioxide absorbs heat and reacts with the remaining char to produce carbon monoxide (producer gas). The presence of water vapour in a gasifier results in the production of hydrogen as a secondary fuel component. There are two main types of gasifier that can be used to carry out this conversion, fixed bed gasifiers and fluidized bed gasifiers. The conversion of biomass into a combustible gas involves a two-stage process. The first, which is called pyrolysis, takes place below 600°C, when volatile components contained within the biomass are released. These may include organic compounds, hydrogen, carbon monoxide, tars and water vapour. Pyrolysis leaves a solid residue called char. In the second stage of the gasification process, this char is reacted with steam or burnt in a restricted quantity of air or oxygen to produce further combustible gas. Depending on the precise design of gasifier chosen, the product gas may have a heating value of 6 – 19 MJ/Nm3. The products of gasification are a mixture of carbon monoxide, carbon dioxide, methane, hydrogen and various hydrocarbons, which can then be used directly in gas turbines, and boilers, or used as precursors for synthesising a wide range of other chemicals. In addition there are a number of methods that can be used to produce higher quality product gases, including indirect heating, oxygen blowing, and pressurisation. After appropriate treatment, the resulting gases can be burned directly for cooking or heat supply, or used in secondary conversion devices, such as internal combustion engines or gas turbines, for producing electricity or shaft power (where it also has the potential for CHP applications). Tagged biomass gasification, biomass gasification process, calorific value, char, Combustion, gasification, gasification technology, gasifier, heat, syngas, thermal conversion, thermal conversion of biomass, thermochemical conversion, what is biomass gasification. Bookmark the permalink. In your diagram, is the grey box labelled “Gas Utilization” what one would consider a CHP plant? And the classification process is something that happens before that, but is separate? Yes all the items listed in Gas Utilization box, excluding flare, can be considered as CHP system.